With a lot of deadfall, climbovers, duck-unders, tree dodging, cow dodging, shallow spots, several very low cattle gates and a 100-yard tunnel, this trip isn’t for everyone. 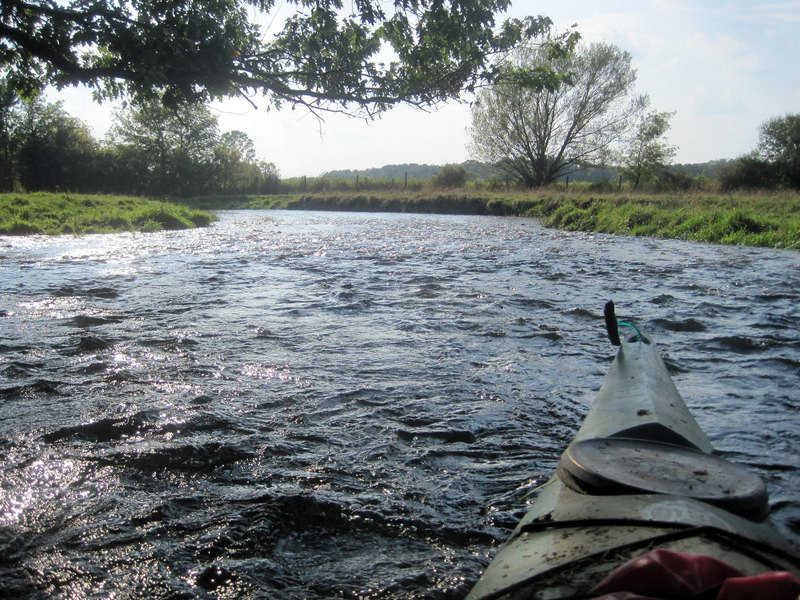 That said, for the courageous paddler, Badger Mill Creek is a fun challenge with clear water, varied terrain, abundant wildlife, several access points, and with an easy bike shuttle, it could be a welcome addition to your Madison happy hour paddling options. Around 4.75′ or 20 CFS is the minimum level and although that seems a bit low, these are fine levels. But any lower means you may be dragging your boat through the rapids. Conversely, much higher and you may have difficulty getting your boat under some of the gates. I would not recommend running the creek above 5′. Time: Put in at 11:30p. Out at 2:45p. Wildlife: Fish, ducks, kingfishers, hawks, muskrat, turtles, heron, crane and cows. Badger Mill creek runs from its source just north of my launch point between Madison and Verona to its confluence with the Sugar River at Riverside Road just southwest of Verona. Similar to Badfish Creek, Badger Mill gets most of its water from the Madison Metropolitan Sewerage District, but unlike the Badfish I’ve never noticed the treated water smell that you sometimes get on the Badfish. Thanks to all the added water, the creek is always clean, clear (well except for the farm runoff) and always has sufficient (or just enough) water to paddle. In the past, the creek has been plagued with numerous deadfall and snags in the section between Old County Road PB and Main Street (Highway M), but this section has now been mostly cleared and there are only three obstacles. Two are fairly simple pullovers, and the other is a big two-trunked tree that lies across the creek which requires a combination duck-under followed by a float under or crawl over. None of those are too bad but you may have to get your feet wet. However, the section after Highway 18/151 is where things really get bogged down. There you’ll encounter five cattle gates – the last being a rather annoying one to get past – more on those below. The put-in is located just downstream from the Highway PB Bridge near the Military Ridge Park and Ride. There’s also a parking area on the south side of the creek for the Verona Community Gardens that makes for easy unloading, but it’s best to park at the Park and Ride as the gate to the gardens is locked when no one is using the gardens. Badger Mill begins channelized and straight, but there’s not much development so it’s easy to forget that you’re in an urban environment. The creek bed is comprised of a nice substrate of sand and gravel, and the channel meanders from side-to-side which creates numerous ledges, holes and shallow spots, which helps keep this section interesting (and seems to be excellent fish habitat since I often see many of them in this section). After passing beneath several pedestrian/bike bridges, you’ll reach the first obstruction, a large tree laying in and across the creek (luckily, it’s not too deep here, and it’s easy to bypass it on creek-left). From there, you’ll pass the backyards of some Brady Bunch-looking homes and shortly before passing below the Main Street bridge, you’ll encounter another large downed-tree that requires a second portage. Debris tends to accumulate at the Main Street bridge, but the left most passage is usually open and has a deeper channel. The creek now flows through Fireman’s Park where there’s a massive tree laying across the creek from bank-to-bank. While I do think it would be a simple portage around the tree, I chose to duck below the first trunk, climb over the second trunk and then return to my boat. After that, the creek becomes narrow, windy and the current picks up a bit on its approach to the Bruce Street Bridge. There’s an easy alternative put-in/take out just past the bridge on creek-left, where there’s a small rapids and it’s also where the USGS gauge resides. If interested in that access point, there’s a parking lot there for easy loading/unloading, but I believe it’s city/county property so it’s probably best to just park on the street. As the creek winds south out of Verona there are a couple of places with branches and trees hanging across the creek, but there’s always a way through. You’ll now start to hear road noise from Highway 18/151 and after a sharp bend you’ll approach the 100+ yard tunnel that will carry you under the Highway. The tunnel has three passages but avoid the middle one as it gets very shallow on the other side. The creek narrows again, the current picks up creating some small riffles and after another small creek/spring on your right, you’ll encounter the first of five sets of cattle gates. The first gate is made up of two parallel cables stretched across the creek about 5′-high with wood fence panels hanging down. Both sections have a few boards missing where you can get through, and the water is only about a foot deep here so it’s easy to get out and float your boat through. Just after that, the creek widens a bit again and there’s a nice area with grassy banks that lead to the second gate. This gate is similar to the first but made with wood pallets and it’s a bit lower, but again it’s shallow and there are places to walk your boat through. After a few turns with a nice riffle or two, you’ll come to a sagging barbed wire fence that seems to serve no purpose except as a danger to kayakers. It’s very loose and could probably be bypassed beneath on creek-right without getting out but I usually get out and walk the boat under on foot. The creek now enters a pretty little wooded valley with a small boulder field, and it kind of has an “up north” feel. You’ll soon pass below Highway 69, a possible (but not great) take-out point. The creek narrows for a bit and the banks get higher, obscuring any view of the surrounding area. Interestingly, every time I’ve run Badger Mill, I’ve seen a (the same?) big old turtle sitting on a half-submerged metal barrel. I believe it’s a Wood Turtle, and it does not seem to be afraid of kayakers as I’ve been able to float by very close to it but it never moves unless I actually bang into the barrel. Shortly after the barrel, you’ll come to the third gate – this one is a bit of a mess. It’s not a true gate as it seems to be designed only as an area for the cows to come and drink, not to cross the water. While not difficult, it requires some caution. This gate/pen is constructed using metal “hog panels” hung from a big wooden beam about 6′ above the water. I believe they were designed to be able to swing downstream, but they are covered with weeds and wired to the supports in some places, so they do not swing very much or easily. The creek there is shallow and the bottom is all gravel so it’s not difficult to get out and float the boat under the fence, and then duck under the gate yourself but it’s semi-cumbersome. Immediately after this gate you’ll be rewarded for all your efforts with a nice 6-12” drop coming out of a 12′ culvert into a small pool. But soon, you’ll come to the fourth gate, again with hanging panels that require getting out and ducking under. Finally after a bit more paddling, the fifth and final gate! Unfortunately this one is the worst, as it’s made of heavy metal gates that do not swing much, and are so low that getting under them requires pushing your boat down into the water. The water is shallow, so it’s not real dangerous, but it’s a hassle, and to duck below requires you to almost put your whole head under water. I have an old boat and I do not care about minor scrapes and scratches, but be aware that this gate can scratch the top of your boat if you are not careful or strong enough to push it down into the water and push/lift the heavy metal gate at the same time. Perhaps it would be easier with two people, but I have only done this trip solo. A few more twists and turns and you’ll soon meet the confluence of the Sugar River at the Riverside Road Bridge. There’s a good take-out option on river-left before the bridge. The rest of the paddle is an easy float on the well-traveled Sugar. There may be few downed trees to navigate around, but local paddlers do a great job of making sure there’s always a way through. The take-out is well marked on river-left just after the Highway 69 bridge. There are two places to actually take-out, one is right at the USGS gauge (a big white PVC tube sitting diagonally in the river) and the other is a few yards further down the river. Both can be a bit muddy and slippery, but I’d recommend the second as it’s a bit shallower and easier to get your boat, and yourself out of the river. What’s nice about Badger Mill Creek is that it’s close to Madison, the water is clear, the current is good, there’s abundant wildlife, varied scenery and there are several put-in and take-out options. The easy bike shuttle is an added bonus. The cattle gates! And cows in the creek. I enjoy all that comes with Badger Mill Creek. For me this is an easy 3-star trip (possibly 4 if we could get the farmer(s) to do something about the cattle gates…) but admittedly, it’s not a trip for everyone since it’s not a lazy day float on the water – you have to be up for a bit of a challenge. If you bike shuttle and take-out at Riverside or Highway 69, Locust Drive offers an easy ride back into Verona where you can catch the Military Ridge Trail all the way back to the Park and Ride.